Hodie 2a vice lecta est Billa, intituled, "An Act for repairing the Roads from the North West Parts of the County of Lincoln, through Nettlam Fields, Wragby-Lane, and Baumber Fields, to The Wolds, or North East Part of the said County." E. Effingham. L. Bp. Rochester. Hodie 3a vice lecta est Billa, intituled, "An Act for confirming certain Articles of Agreement, made between Edward Westall and his Wife, and Robert Corr an Infant, and others; and to enable the said Robert Corr to perform a Contract, for Sale of certain Lands therein mentioned." Hodie 3a vice lecta est Billa, intituled, "An Act to establish and confirm an Agreement, made between Sir William Courtenay Baronet, and his Brother Henry Reginald Courtenay Esquire; and to render the same effectual to the several Uses and Purposes therein mentioned." To carry down both the said Bills, and to desire their Concurrence to them. With a Bill, intituled, "An Act to continue the Duties for Encouragement of the Coinage of Money;" to which they desire the Concurrence of this House. The Earl of Aylesford reported from the Lords Committees to whom the Bill, intituled, "An Act for enclosing Part of certain Common Fields, in the Township of Pailton, in the County of Warwick," was committed: "That they had considered the said Bill, and examined the Allegations thereof, which they found to be true; that the Parties concerned had given their Consents; and that the Committee had gone through the Bill, and made One Amendment thereunto." Hodie 1a vice lecta est Billa, intituled, "An Act for Sale of Part of the Estate of William Earl of Inchiquin, in the Kingdom of Ireland, for Payment of the Debts and Encumbrances charged thereupon; and for settling such Part thereof as shall remain unsold, according to his Marriage Agreement." Hodie 3a vice lecta est Billa, intituled, "An Act to enable the Parishioners of the Parish of Ealing, in the County of Middlesex, to raise Money, by Rates upon themselves, for finishing the Church of the said Parish." Hodie 1a vice lecta est Billa, intituled, "An Act to enable Edward Duke of Norfolk to grant Building Leases, for Ninety-nine Years, of all or any Part of his Lands, in or near the Township of Sheffield, in the County of York." Hodie 3a vice lecta est Billa, intituled, "An Act for naturalizing James Tracy." 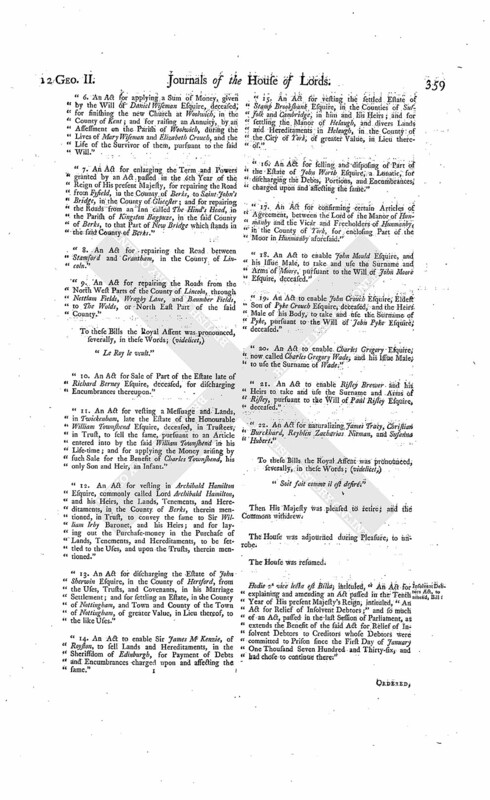 Serjeant at Arms, Account of what he had done, to attach White et al. for arresting Lord Visc. Primrose. He thereupon acquainted their Lordships, "That he immediately sent a Messenger to Ireland, to execute the said Order; and had recived from him Two Letters, one dated the 4th, and the other the 27th, of last Month; giving an Account, "That he had attached the said John White, but himself and Two Men with him were beat off by the Mob; and that he had since been after him in the Country; but to no Purpose; and as to Mr. Gonne, he had not seen him as yet; and what to do, he did not know." The Serjeant further informed the House, "That he had since sent another Messenger to Ireland, from whom he had not heard any Thing as yet; but he believed he should soon hear from him." Ordered, That the Proceedings which have been had, in order to the carrying the said Order of Attach ment into Execution, be taken into Consideration on Tuesday next; and the Lords to be summoned. Hodie 2a vice lecta est Billa, intituled, "An Act for enlarging the Term and Powers granted by an Act passed in the 6th Year of the Reign of His present Majesty, for repairing the Road from Fyfield, in the County of Berks, to Saint John's Bridge, in the County of Glocester; and for repairing the Roads from an Inn called The Hind's Head, in the Parish of Kingston Bagpuze, in the said County of Berks, to that Part of New Bridge which lies in the said County of Berks." Hodie 2a vice lecta est Billa, intituled, "An Act for applying a Sum of Money given by the Will of Daniel Wiseman Esquire, deceased, for finishing the new Church at Woolwich, in the County of Kent; and for raising an Annuity, by an Assessment on the Parish of Woolwich, during the Lives of Mary Wiseman and Elizabeth Crouch, and the Life of the Survivor of them, pursuant to the said Will." Lavallin et al. against Gould. It is Ordered, That the further Hearing of the said Cause be adjourned till To-morrow; and that the Cause appointed for that Day be put off to Friday next; and the Cause appointed for that Day be put off to the Monday following; and the other Causes on Cause-days removed in Course. Dominus Cancellarius declaravit præsens Parliamentum continuandum esse usque at et in diem Jovis, duodecimum diem instantis Aprilis, hora undecima Auroræ, Dominis sic decernentibus. Hodie 2a vice lecta est Billa, intituled, "An Act for Sale of Part of the Estate of William Earl of Inchiquin, in the Kingdom of Ireland, for Payment of Debts and Encumbrances charged thereupon; and for settling such Part thereof as shall remain unsold, according to his Marriage Agreement." Their Lordships, or any Five of them; to meet on Friday the 27th Instant, at the usual Time and Place; and to adjourn as they please. Then it was moved, "That the Standing Order, requiring Fourteen Days Notice to be given of the Meeting of Committees on Private Bills, may be so far dispensed with, as that the Committee abovenamed may meet on a sooner Day, in regard this Session of Parliament is far advanced." The Earl of Warwick reported from the Committee of the whole House to whom the Bill, intituled, "An Act for allowing further Time for Enrolment of Deeds and Wills made by Papists; and for Relief of Protestant Purchasers, Devisees, and Lessees," was committed, the Amendments made by the Committee to the said Bill. Insolvent Debtors Act, for explaining, Bill to be printed. 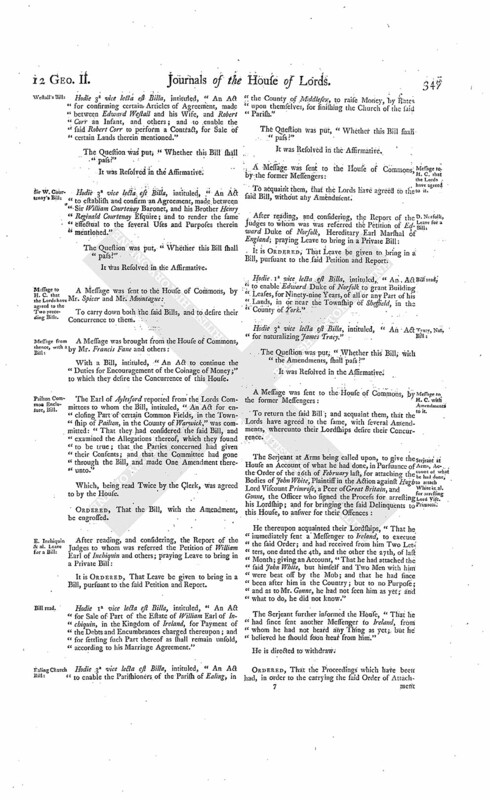 Ordered, That the Bill, intituled, "An Act for explaining and amending an Act passed in the Tenth Year of His present Majesty's Reign, intituled, "An Act for Relief of Insolvent Debtors;" and so much of an Act passed in the last Session of Parliament, as extends the Benefit of the said Act for Relief of Insolvent Debtors to Creditors, whose Debtors were committed to Prison since the First Day of January One Thousand Seven Hundred and Thirty-six, and had chose to continue there," be printed. Commyns' Bill, for Sale of Sir J. Lear's Estate. Hodie 2a vice lecta est Billa, intituled, "An Act for Sale of Part of the Estate late of Sir John Lear Baronet, deceased, in the County of Devon, for Payment of his Debts; and for other Purposes therein mentioned." Their Lordships, or any Five of them; to meet on the First Day after the Recess at Easter; and to adjourn as they please. Hodie 2a vice lecta est Billa, intituled, "An Act for the Exchange of certain Lands, in the several Parishes of Wroughton and Liddyard Treagooze, in the County of Wilts, between the Governors of the Hospital commonly called The Charter-house, and Thomas Bennet, of Salthrop, in the said County of Wilts, Esquire." Their Lordships, or any Five of them; to meet on the Second Day after the Recess at Easter; and to adjourn as they please. Hodie 2a vice lecta est Billa, intituled, "An Act to enable Edward Duke of Norfolk to grant Building Leases, for Ninety-nine Years, of all or any Part of his Lands, in or near the Township of Sheffield, in the County of York." Their Lordships, or any Five of them; to meet on the same Day as on the last mentioned Bill; and to adjourn as they please. Hodie 3a vice lecta est Billa, intituled, "An Act for enclosing Part of certain Common Fields, the Township of Pailton, in the County of Warwick." The Lord Bishop of Rochester reported from the Lords Committees to whom the Bill, intituled, "An Act for applying a Sum of Money given by the Will of Daniel Wiseman Esquire, deceased, for finishing the new Church at Woolwich, in the County of Kent; and for raising an Annuity, by an Assessment on the Parish of Woolwich, during the Lives of Mary Wiseman and Elizabeth Crouch, and the Life of the Survivor of them, pursuant to the said Will," was committed: "That they had considered the said Bill, and examined the Allegations thereof, which they found to be true; and that the Committee had gone through the Bill, and directed him to report the same to the House, without any Amendment." 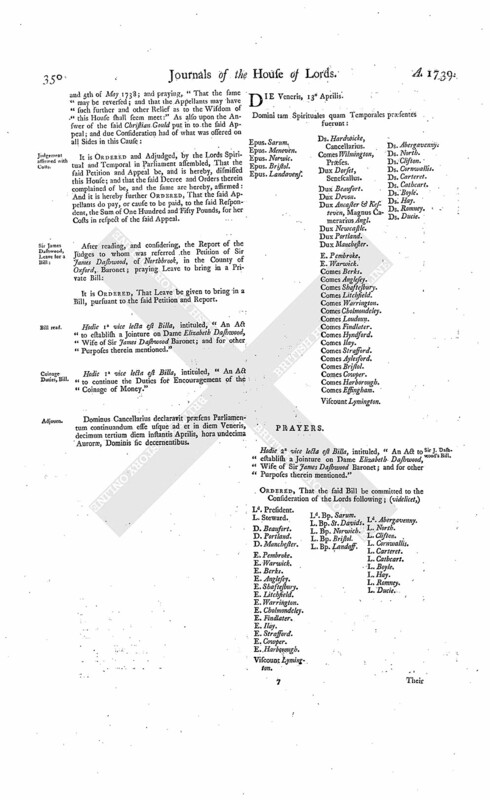 The Lord Bathurst made the like Report from the Committee to whom the Bill, intituled, "An Act for enlarging the Term and Powers granted by an Act passed in the 6th Year of the Reign of His present Majesty, for repairing the Road from Fyfield, in the County of Berks, to Saint John's Bridge, in the County of Glocester; and for repairing the Roads from an Inn called The Hind's Head, in the Parish of Kingston Bagpuze, in the said County of Berks, to that Part of New Bridge which lies in the said County of Berks," was committed. Lavallin & al. against Gould. 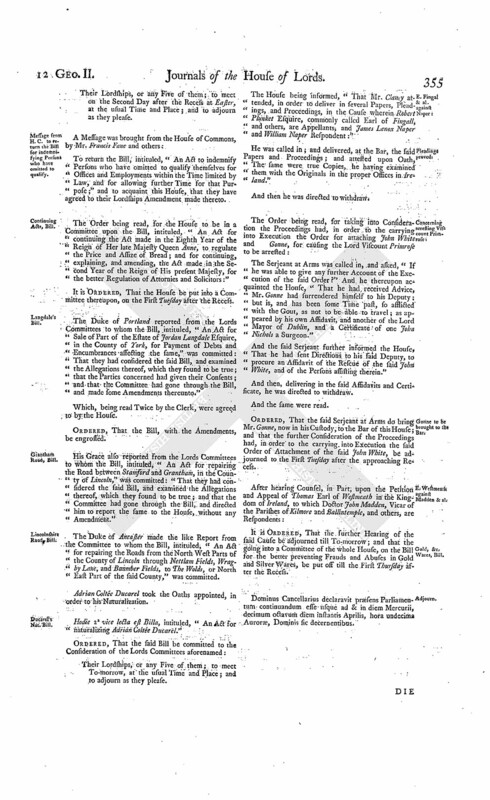 It is Ordered and Adjudged, by the Lords Spiritual and Temporal in Parliament assembled, That the said Petition and Appeal be, and is hereby, dismissed this House; and that the said Decree and Orders therein complained of be, and the same are hereby, affirmed: And it is hereby further Ordered, That the said Appellants do pay, or cause to be paid, to the said Respondent, the Sum of One Hundred and Fifty Pounds, for her Costs in respect of the said Appeal. Hodie 1a vice lecta est Billa, intituled, "An Act to establish a Jointure on Dame Elizabeth Dashwood, Wife of Sir James Dashwood Baronet; and for other Purposes therein mentioned." Hodie 1a vice lecta est Billa, intituled, "An Act to continue the Duties for Encouragement of the Coinage of Money." Dominus Cancellarius declaravit præsens Parliamentum continuandum esse usque ad et in diem Veneris, decimum tertium diem instantis Aprilis, hora undecima Auroræ, Dominis sic decernentibus. Hodie 2a vice lecta est Billa, intituled, "An Act to establish a Jointure on Dame Elizabeth Dashwood, Wife of Sir James Dashwood Baronet; and for other Purposes therein mentioned." Viscount Lymington. Ld. Bp. Sarum. Their Lordships, or any Five of them; to meet on the First Day after the Recess at Easter, at the usual Time and Place; and to adjourn as they please. 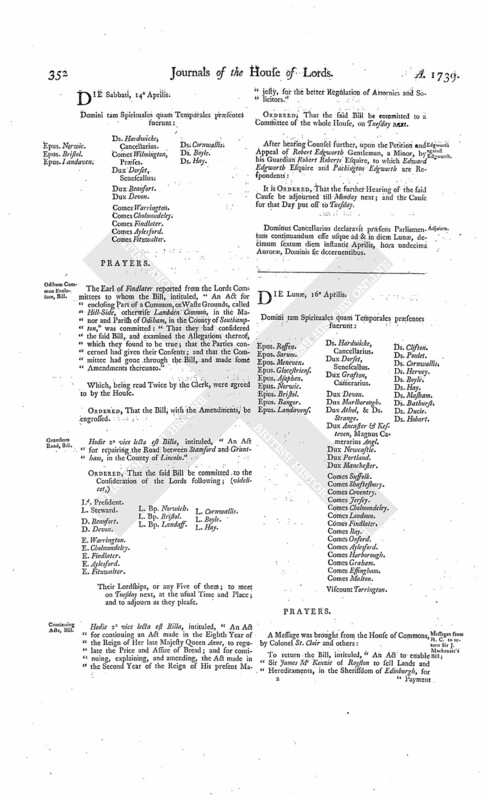 With a Bill, intituled, "An Act for continuing the Act made in the Eighth Year of the Reign of Her late Majesty Queen Anne, to regulate the Price and Assize of Bread; and for continuing, explaining, and amending, the Act made in the Second Year of the Reign of His present Majesty, for the better Regulation of Attornies and Solicitors;" to which they desire the Concurrence of this House. With a Bill, intituled, "An Act for repairing the Road between Stamford and Grantham, in the County of Lincoln;" to which they desire the Concurrence of this House. Hodie 3a vice lecta est Billa, intituled, "An Act for applying a Sum of Money, given by the Will of Daniel Wiseman Esquire, deceased, for finishing the new Church at Woolwich, in the County of Kent; and for raising an Annuity, by an Assessment on the Parish of Woolwich, during the Lives of Mary Wiseman and Elizabeth Crouch, and the Life of the Survivor of them, pursuant to the said Will." Hodie 3a vice lecta est Billa, intituled, "An Act for enlarging the Term and Powers granted by an Act passed in the 6th Year of the Reign of His present Majesty, for repairing the Road from Fyfield, in the County of Berks, to Saint John's Bridge, in the County of Glocester; and for repairing the Roads from an Inn called The Hind's Head, in the Parish of Kingston Bagpuze, in the said County of Berks, to that Part of New Bridge which lies in the said County of Berks." To acquaint them, that the Lords have agreed to both the said Bills, without any Amendment. Committee shortened, on E. Inchiquin's Bill. It is Ordered, That the said Committee may meet, to consider of the said Bill, on Monday next. Hodie 2a vice lecta est Billa, intituled, "An Act to continue the Duties for Encouragement of the Coinage of Money." It is Ordered, That the further Hearing of this Cause be adjourned till To-morrow; and the Counsel to be called in, at Twelve a Clock. Dominus Cancellarius declaravit præsens Parliamentum continuandum esse usque ad & in diem Sabbati, decimum quartum diem instantis Aprilis, hora undecima Auroræ, Dominis sic decernentibus. The Earl of Findlater reported from the Lords Committees to whom the Bill, intituled, "An Act for enclosing Part of a Common, or Waste Grounds, called Hill-Side, otherwise Lambden Common, in the Manor and Parish of Odiham, in the County of Southampton," was committed: "That they had considered the said Bill, and examined the Allegations thereof, which they found to be true; that the Parties concerned had given their Consents; and that the Committee had gone through the Bill, and made some Amendments thereunto." Hodie 2a vice lecta est Billa, intituled, "An Act for repairing the Road between Stamford and Grantham, in the County of Lincoln." E. Fitzwalter. L. Bp. Norwich. L. Bp. Landaff. L. Cornwallis. Hodie 2a vice lecta est Billa, intituled, "An Act for continuing an Act made in the Eighth Year of the Reign of Her late Majesty Queen Anne, to regulate the Price and Assize of Bread; and for continuing, explaining, and amending, the Act made in the Second Year of the Reign of His present Majesty, for the better Regulation of Attornies and Solicitors." It is Ordered, That the further Hearing of the said Cause be adjourned till Monday next; and the Cause for that Day put off to Tuesday. Dominus Cancellarius declaravit præsens Parliamentum continuandum esse usque ad & in diem Lunæ, decimum sextum diem instantis Aprilis, hora undecima Auroræ, Dominis sic decernentibus. To return the Bill, intituled, "An Act to enable Sir James Mc Kenzie of Royston to fell Lands and Hereditaments, in the Sheriffdom of Edinburgh, for Payment of Debts and Encumbrances charged upon and affecting the same;" and to acquaint this House, that they have agreed to the same, without any Amendment. To return the Bill, intituled, "An Act for naturalizing James Tracy;" and to acquaint this House, that they have agreed to their Lordships Amendments made thereto. The Earl of Oxford reported from the Lords Committees to whom the Bill, intituled, "An Act to enable the most Noble William Duke of Portland to grant Building Leases of certain Messuages, Pieces, and Parcels of Ground, in Soho-Fields, in the County of Middlesex, for a farther Term than he is empowered to grant by his Marriage Settlement," was committed: "That they had considered the said Bill, and examined the Allegations thereof, which they found to be true; that the Parties concerned had given their Consents; and that the Committee had gone through the Bill, and directed him to report the same to the House, without any Amendment." The Earl of Warwick reported from the Lords Committees to whom the Bill, intituled, "An Act for Sale of Part of the Estate of William Earl of Inchiquin in the Kingdom of Ireland, for Payment of the Debts and Encumbrances charged thereupon; and for settling such Part thereof as shall remain unsold, according to his Marriage Agreement," was committed: That they had considered the said Bill, and examined the Allegations thereof, which they found to be true; that the Parties concerned had given their Consents; and that the Committee had gone through the Bill, and made some Amendments thereunto." Which, being read by the Clerk, were agreed to by the House. Hodie 3a vice lecta est Billa, intituled, "An Act for enclosing Part of a Common, or Waste Grounds, called Hill-Side, otherwise Lambden-Common, in the Manor and Parish of Odiham, and County of Southampton." The House (according to Order) was adjourned during Pleasure, and put into a Committee upon the Bill, intituled, "An Act for continuing the Acts for Encouragement of the Coinage of Money." And the Earl of Warwick reported from the said Committee, "That they had gone through the Bill; and directed him to report the same to the House, without any Amendment." It is Ordered and Adjudged, by the Lords Spiritual and Temporal in Parliament assembled, That the said Petition and Appeal be, and is hereby, dismissed this House; and that the said Orders therein complained of be, and the same are hereby, affirmed: And it is further Ordered, That the said Appellant do pay, or cause to be paid, to the said Respondent Packington Edgworth, the Sum of One Hundred and Fifty Pounds, for his Costs in respect of the said Appeal: And it is hereby Declared, That, notwithstanding the Affirmance of the said Orders, if any of the Parties shall apply to the said Court of Exchequer, that the Issues directed as to the Articles of 1692, and the Settlement of 1703, and the Endorsement thereon, and the Issues directed as to the Deeds of 30th of June and 1st of July 1730, may respectively be tried in different Records, the said Court may give such Directions therein as to the said Court shall seem just. Hodie 1a vice lecta est Billa, intituled, "An Act to enable the Executors named in the Will of Edward Warren, late of Pointon, in the County of Chester, Esquire, deceased, to sell Part, and lease other Parts, of his settled Estate, to raise Money, for discharging the Encumbrances thereon; and for other Purposes therein mentioned." Accordingly the Earl of Harborough presented to the House a Bill, intituled, "An Act for naturalizing Adrian Coltée Ducarel." It is Ordered, That the House be put into a Committee thereupon on Wednesday next; and that Counsel may be then heard, as well for as against the same, before the said Committee, according to the former Order. Sir W. Billers & al. against D Norfolk & al. Ordered, That the Cause wherein Sir William Billers and others, Trustees for the York Buildings Company, are Appellants, and the Duke of Norfolk and others Respondents, which stands to be heard on Wednesday next, be put off to the First Day for Causes after the approaching Recess; and that the other Causes on Cause-days do afterwards come on in Course. Dominus Cancellarius declaravit præsens Parliamentum continuandum esse usque ad & in diem Martis, decimum septimum diem instantis Aprilis, hora undecima Auroræ, Dominis sic decernentibus. Comes Malton. Ds. Harrington, Unus Primariorum Secretariorum. 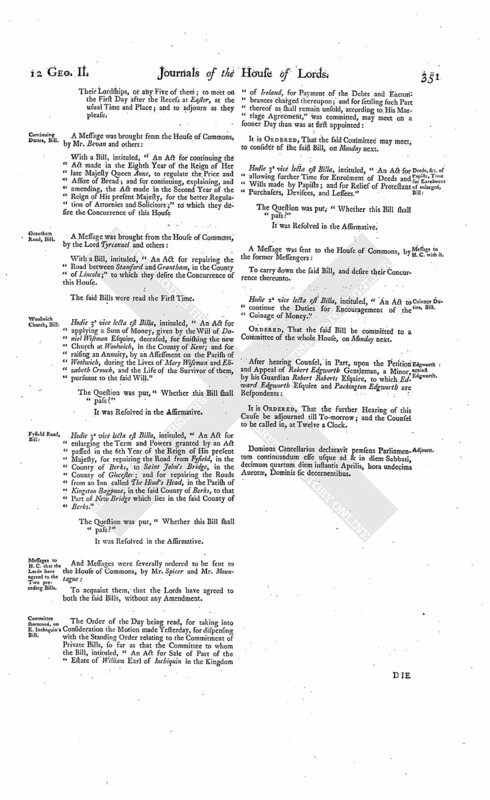 Hodie 3a vice lecta eft Billa, intituled, "An Act to enable the most Noble William Duke of Portland to grant Building Leases of certain Messuages, Pieces, and Parcels of Grounds, in Soho-Fields, in the County of Middlesex, for a farther Term than he is empowered to grant by his Marriage Settlement." Hodie 3a vice lecta eft Billa, intituled, "An Act for Sale of Part of the Estate of William Earl of Inchiquin in the Kingdom of Ireland, for Payment of the Debts and Encumbrances charged thereupon; and for settling such Part thereof as shall remain unsold, according to his Marriage Agreement." Hodie 2a vice lecta est Billa, intituled, "An Act to enable the acting Executors and Testamentary Guardians named in the Will of Edward Warren, late of Pointon, in the County of Chester, Esquire, deceased, by selling Part, and leasing other Parts, of his settled Estate, to raise Money, for discharging the Encumbrances thereon, and to provide a sufficient Maintenance for his Son during his Minority, in Ease of an Estate directed to be sold by the Will of John Warren Esquire, deceased." E. Effingham. Ld. Abp. Cant. L. Bp. Landaff. Ld. Harrington, Sec. Their Lordships, or any Five of them; to meet on the Second Day after the Recess at Easter, at the usual Time and Place; and to adjourn as they please. Message from H. C. to return the Bill for indemnifying Persons who have omitted to qualify. 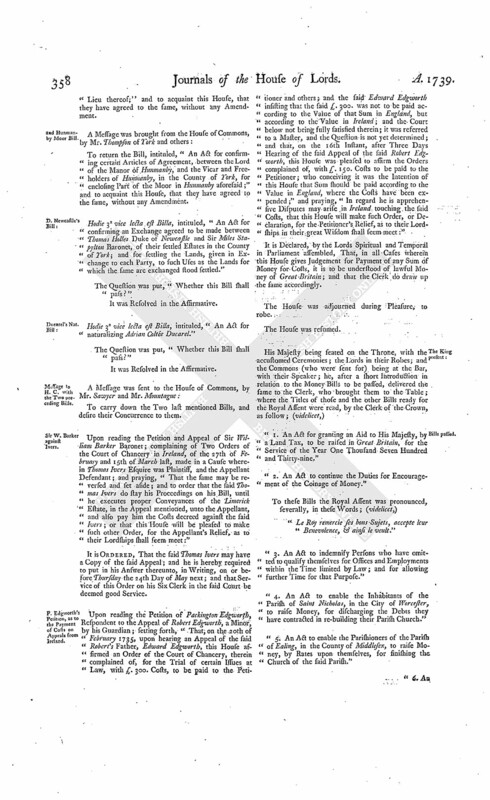 To return the Bill, intituled, "An Act to indemnify Persons who have omitted to qualify themselves for Offices and Employments within the Time limited by Law, and for allowing further Time for that Purpose;" and to acquaint this House, that they have agreed to their Lordships Amendment made thereto. It is Ordered, That the House be put into a Committee thereupon, on the First Tuesday after the Recess. The Duke of Portland reported from the Lords Committees to whom the Bill, intituled, "An Act for Sale of Part of the Estate of Jordan Langdale Esquire, in the County of York, for Payment of Debts and Encumbrances affecting the same," was committed: That they had considered the said Bill, and examined the Allegations thereof, which they found to be true; that the Parties concerned had given their Consents; and that the Committee had gone through the Bill, and made some Amendments thereunto." His Grace also reported from the Lords Committees to whom the Bill, intituled, "An Act for repairing the Road between Stamford and Grantham, in the County of Lincoln," was committed: "That they had considered the said Bill, and examined the Allegations thereof, which they found to be true; and that the Committee had gone through the Bill, and directed him to report the same to the House, without any Amendment." The Duke of Ancaster made the like Report from the Committee to whom the Bill, intituled, "An Act for repairing the Roads from the North West Parts of the County of Lincoln through Nettlam Fields, Wragby Lane, and Baumber Fields, to The Wolds, or North East Part of the said County," was committed. Adrian Coltée Ducarel took the Oaths appointed, in order to his Naturalization. Hodie 2a vice lecta est Billa, intituled, "An Act for naturalizing Adrian Coltée Ducarel." The House being informed, "That Mr. Clancy attended, in order to deliver in several Papers, Pleadings, and Proceedings, in the Cause wherein Robert Plunket Esquire, commonly called Earl of Fingall, and others, are Appellants, and James Lenox Naper and William Naper Respondent:"
He was called in; and delivered, at the Bar, the said Papers and Proceedings; and attested upon Oath, The same were true Copies, he having examined them with the Originals in the proper Offices in Ireland." The Serjeant at Arms was called in, and asked, "If he was able to give any further Account of the Execution of the said Order?" And he thereupon acquainted the House, "That he had received Advice, Mr. Gonne had surrendered himself to his Deputy; but is, and has been some Time past, so afflicted with the Gout, as not to be able to travel; as appeared by his own Affidavit, and another of the Lord Mayor of Dublin, and a Certificate of one John Nichols a Surgeon." And the said Serjeant further informed the House, That he had sent Directions to his said Deputy, to procure an Affidavit of the Rescue of the said John White, and of the Persons assisting therein." And then, delivering in the said Affidavits and Certificate, he was directed to withdraw. Gonne to be brought to the Bar. Ordered, That the said Serjeant at Arms do bring Mr. Gonne, now in his Custody, to the Bar of this House; and that the further Consideration of the Proceedings had, in order to the carrying into Execution the said Order of Attachment of the said John White, be adjourned to the First Tuesday after the approaching Recess. E. Westmeath against Madden & al. It is Ordered, That the further Hearing of the said Cause be adjourned till To-morrow; and that the going into a Committee of the whole House, on the Bill for the better preventing Frauds and Abuses in Gold and Silver Wares, be put off till the First Thursday after the Recess. Dominus Cancellarius declaravit præsens Parliamentum continuandum esse usque ad & in diem Mercurii, decimum octavum diem instantis Aprilis, hora undecima Auroræ, Dominis sic decernentibus. The Order and Judgement of this House, made on Monday last, in the Cause wherein Robert Edgworth Gentleman is Appellant, and Edward Edgworth and Packington Edgworth are Respondents, being read, was approved of. Writings to be transmitted back to the Exchequer in Ireland. Ordered, That the Articles bearing Date the 5th of July 1692, the Settlement by Deeds of Lease and Release bearing Date respectively the 24th and 25th of December 1703, and also the Settlement bearing Date the 17th of June 1703, and also the Settlement bearing Date the 7th of November 1701, and also the attested (fn. 1) Copy of the Letter signed Mar. Tattle, which were transmitted by Order of the Court of Exchequer in Ireland, sealed up by the Chief Remembrancer of that Court, or his Deputy, and brought over by Mr. Richard Brereton, and, by Order of this House, lodged with the Clerk; be by him sealed up, and delivered to the said Brereton, to be transmitted back, and delivered by him to the said Chief Remembrancer, or his Deputy; and that the said Brereton do deliver the said Writings accordingly. The Earl of Harborough reported from the Lords Committees to whom the Bill, intituled, "An Act for naturalizing Adrian Coltée Ducarel," was committed: That they had considered the said Bill, and examined the Allegations thereof, which they found to be true; and that the Committee had gone through the Bill, and directed him to report the same to the House, without any Amendment." The Duke of Portland reported from the Lords Committees to whom the Bill, intituled, "An Act for confirming an Exchange agreed to be made between Thomas Holles Duke of Newcastle and Sir Miles Stapylton Baronet, of their settled Estates in the County of York; and for settling the Lands given in Exchange to each Party to such Uses as the Lands for which the same were exchanged stood settled," was committed: "That they had considered the said Bill, and examined the Allegations thereof, which they found to be true; that the Parties concerned had given their Consents; and that the Committee had gone through the Bill, and made some Amendments thereunto." 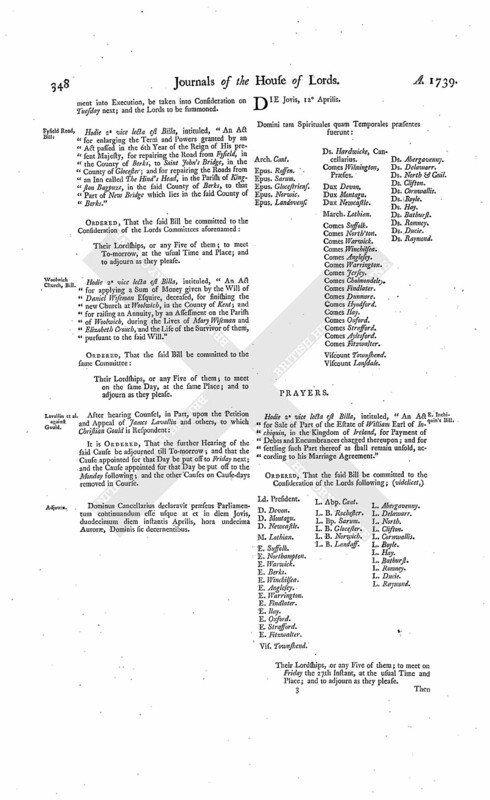 The Lord Bathurst made the like Report from the Committee to whom the Bill, intituled, "An Act for dividing and enclosing the Common Fields lying in the Manor of Shipton Moyne, within the Parish of Shipton Moyne and Dovel, in the County of Glocester, commonly called The North and South Common Fields," was committed. Ordered, That the said Three last mentioned Bills be engrossed. Hodie 3a vice lecta est Billa, intituled, "An Act to continue the Duties for Encouragement of the Coinage of Money." Hodie 3a vice lecta est Billa, intituled, "An Act for repairing the Roads from the North West Parts of the County of Lincoln through Nettlam Fields, Wragby Lane, and Baumber Fields, to The Wolds, or North East Part of the said County." Hodie 3a vice lecta est Billa, intituled, "An Act for repairing the Road between Stamford and Grantham, in the County of Lincoln." Hodie 3a vice lecta est Billa, intituled, "An Act for Sale of Part of the Estate of Jordan Langdale Esquire, in the County of York, for Payment of Debts and Encumbrances affecting the same." 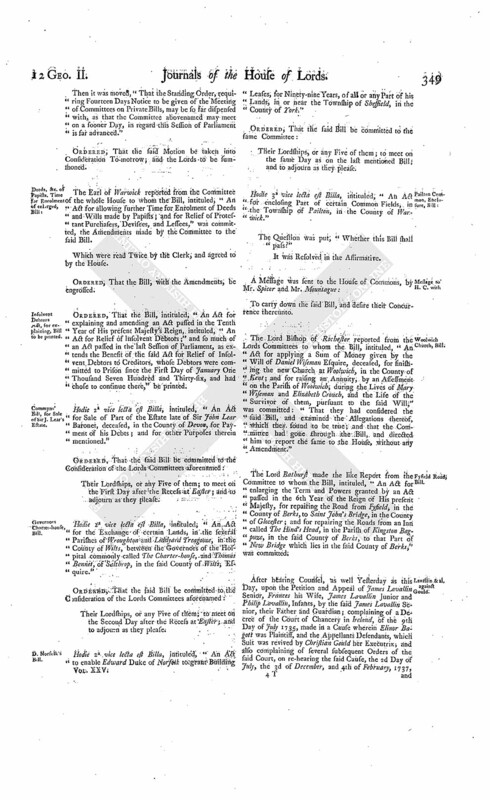 It is Ordered and Adjudged, by the Lords Spiritual and Temporal in Parliament assembled, That the said Order complained of in the said Appeal be, and the same is hereby, affirmed, with the following Variations and Additions; (videlicet,) That, instead of the said Issues as now framed, the same be in Manner following; (that is to say,) "Whether the Appellant is entitled to Four Pence, out of the Nine Pence Composition, for every Milch Cow within the said Parishes, or to any other and what Part or Proportion thereof?" And also, "Whether the Appellant is entitled to Two Pence, out of the Four Pence Halfpenny Composition, for ever Strapper within the said Parishes; or to any or what Part or Proportion thereof?" And it is hereby further Ordered, That in case the Jury who shall try the said Issues shall find any other Parts or Proportions of the said Compositions than such as shall be particularly described therein, then the Judge, before whom the said Issues shall be tried, do cause the same to be endorsed, or marked, on the Postea or Certificate of the Verdict. Dominus Cancellarius declaravit præsens Parliamentum continuandum esse usque ad & in diem Jovis, decimum nonum diem instantis Aprilis, hora undecima Auroræ, Dominis sic decernentibus. To return the Bill, intituled, "An Act for selling and disposing of Part of the Estate of John Worth Esquire, a Lunatic, for discharging the Debts, Portions, and Encumbrances, charged upon and affecting the same;" and to acquaint this House, that they have agreed to the same, without any Amendment. To return the Bill, intituled, "An Act for vesting the settled Estate of Stamp Brooksbank Esquire, in the Counties of Suffolk and Cambridge, in him and his Heirs; and for settling the Manor of Helaugh, and divers Lands and Hereditaments in Helaugh, in the County of the City of York, of greater Value, in Lieu thereof;" and to acquaint this House, that they have agreed to the same, without any Amendment. and Hunman by Moor Bill. To return the Bill, intituled, "An Act for confirming certain Articles of Agreement, between the Lord of the Manor of Hunmanby, and the Vicar and Freeholders of Hunmanby, in the County of York, for enclosing Part of the Moor in Hunmanby aforesaid;" and to acquaint this House, that they have agreed to the same, without any Amendment. Hodie 3a vice lecta est Billa, intituled, "An Act for confirming an Exchange agreed to be made between Thomas Holles Duke of Newcastle and Sir Miles Stapylton Baronet, of their settled Estates in the County of York; and for settling the Lands, given in Exchange to each Party, to such Uses as the Lands for which the same are exchanged stood settled." Hodie 3a vice lecta est Billa, intituled, "An Act for naturalizing Adrian Coltée Ducarel." To carry down the Two last mentioned Bills, and desire their Concurrence to them. Upon reading the Petition and Appeal of Sir William Barker Baronet; complaining of Two Orders of the Court of Chancery in Ireland, of the 27th of February and 15th of March last, made in a Cause wherein Thomas Ivers Esquire was Plaintiff, and the Appellant Defendant; and praying, "That the same may be reversed and set aside; and to order that the said Thomas Ivers do stay his Proceedings on his Bill, until he executes proper Conveyances of the Limerick Estate, in the Appeal mentioned, unto the Appellant, and also pay him the Costs decreed against the said Ivers; or that this House will be pleased to make such other Order, for the Appellant's Relief, as to their Lordships shall seem meet:"
It is Ordered, That the said Thomas Ivers may have a Copy of the said Appeal; and he is hereby required to put in his Answer thereunto, in Writing, on or before Thursday the 24th Day of May next; and that Service of this Order on his Six Clerk in the said Court be deemed good Service. 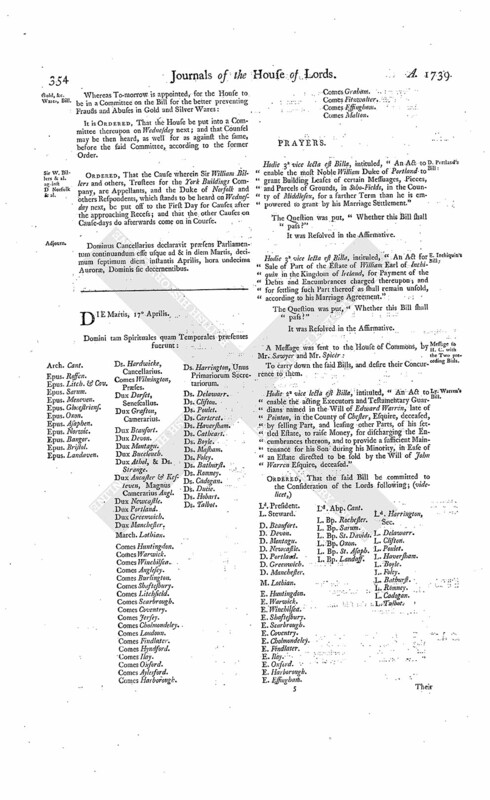 P. Edgworth's Petition, as to the Payment of Costs on Appeals from Ireland. Upon reading the Petition of Packington Edgworth, Respondent to the Appeal of Robert Edgworth, a Minor, by his Guardian; setting forth, "That, on the 20th of February 1735, upon hearing an Appeal of the said Robert's Father, Edward Edgworth, this House affirmed an Order of the Court of Chancery, therein complained of, for the Trial of certain Issues at Law, with £. 300. Costs, to be paid to the Petitioner and others; and the said Edward Edgworth insisting that the said £. 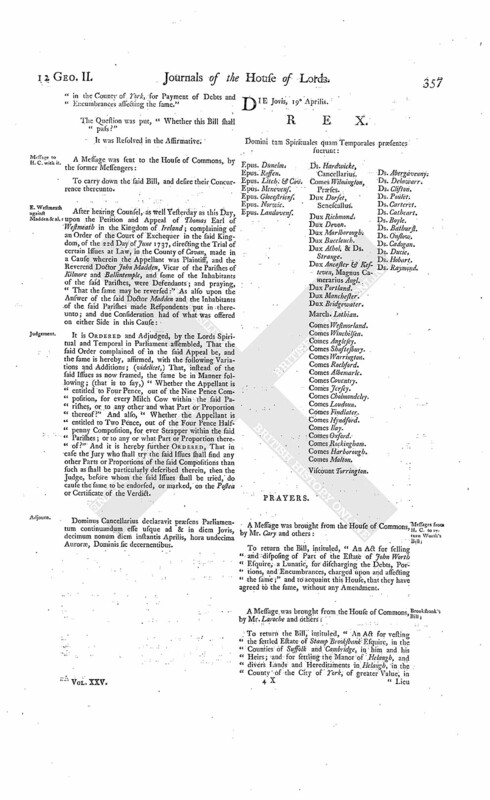 300. was not to be paid according to the Value of that Sum in England, but according to the Value in Ireland; and the Court below not being fully satisfied therein; it was referred to a Master, and the Question is not yet determined; and that, on the 16th Instant, after Three Days Hearing of the said Appeal of the said Robert Edgworth, this House was pleased to affirm the Orders complained of, with £. 150. 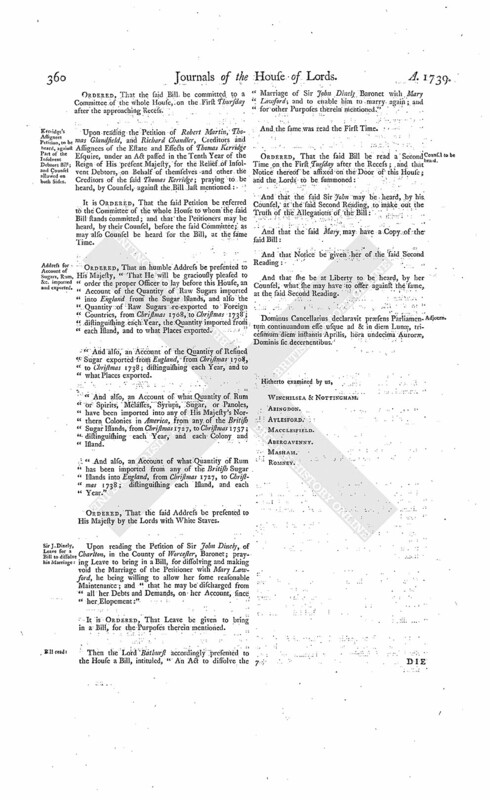 Costs to be paid to the Petitioner; who conceiving it was the Intention of this House that Sum should be paid according to the Value in England, where the Costs have been expended;" and praying, "In regard he is apprehensive Disputes may arise in Ireland touching the said Costs, that this House will make such Order, or Declaration, for the Petitioner's Relief, as to their Lordships in their great Wisdom shall seem meet:"
It is Declared, by the Lords Spiritual and Temporal in Parliament assembled, That, in all Cases wherein this House gives Judgement for Payment of any Sum of Money for Costs, it is to be understood of lawful Money of Great Britain; and that the Clerk do draw up the same accordingly. "1. An Act for granting an Aid to His Majesty, by a Land Tax, to be raised in Great Britain, for the Service of the Year One Thousand Seven Hundred and Thirty-nine." "2. An Act to continue the Duties for Encouragement of the Coinage of Money." "3. An Act to indemnify Persons who have omitted to qualify themselves for Offices and Employments within the Time limited by Law; and for allowing further Time for that Purpose." "4. An Act to enable the Inhabitants of the Parish of Saint Nicholas, in the City of Worcester, to raise Money, for discharging the Debts they have contracted in re-building their Parish Church." "5. An Act to enable the Parishioners of the Parish of Ealing, in the County of Middlesex, to raise Money, by Rates upon themselves, for finishing the Church of the said Parish." "6. 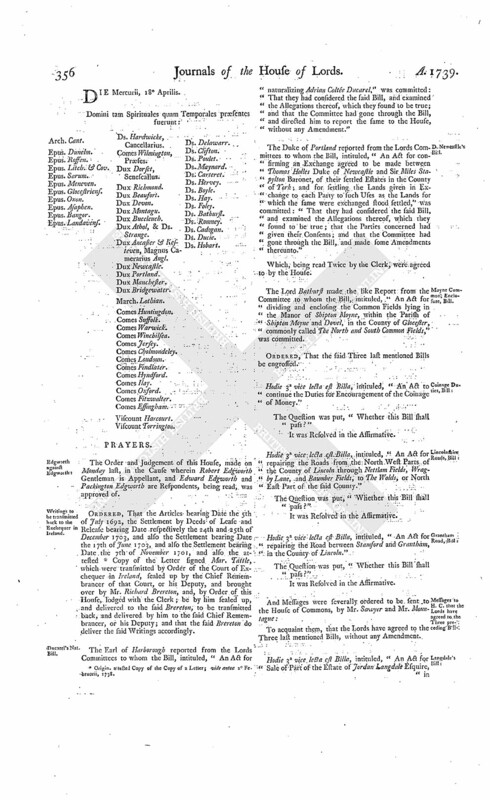 An Act for applying a Sum of Money, given by the Will of Daniel Wiseman Esquire, deceased, for finishing the new Church at Woolwich, in the County of Kent; and for raising an Annuity, by an Assessment on the Parish of Woolwich, during the Lives of Mary Wiseman and Elizabeth Crouch, and the Life of the Survivor of them, pursuant to the said Will." "7. An Act for enlarging the Term and Powers granted by an Act passed in the 6th Year of the Reign of His present Majesty, for repairing the Road from Fyfield, in the County of Berks, to Saint John's Bridge, in the County of Glocester; and for repairing the Roads from an Inn called The Hind's Head, in the Parish of Kingston Bagpuze, in the said County of Berks, to that Part of New Bridge which stands in the said County of Berks." "8. 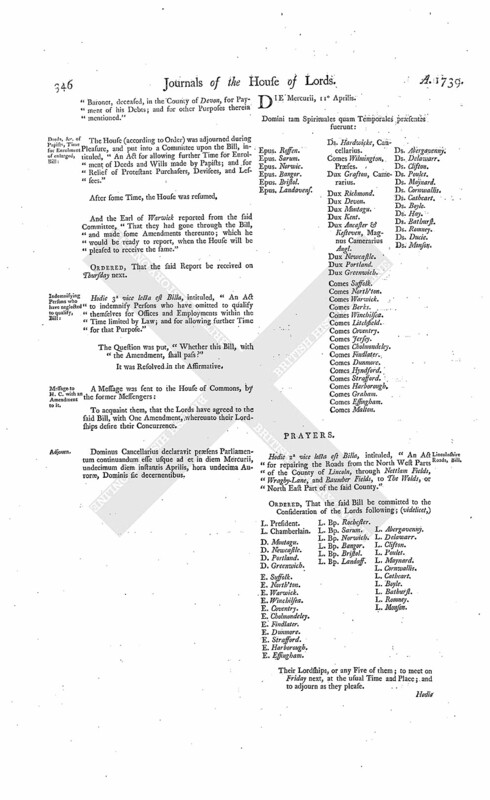 An Act for repairing the Road between Stamford and Grantham, in the County of Lincoln." "9. An Act for repairing the Roads from the North West Parts of the County of Lincoln, through Nettlam Fields, Wraghy Lane, and Baumber Fields, to The Wolds, or North East Part of the said County." "10. An Act for Sale of Part of the Estate late of Richard Berney Esquire, deceased, for discharging Encumbrances thereupon." "11. 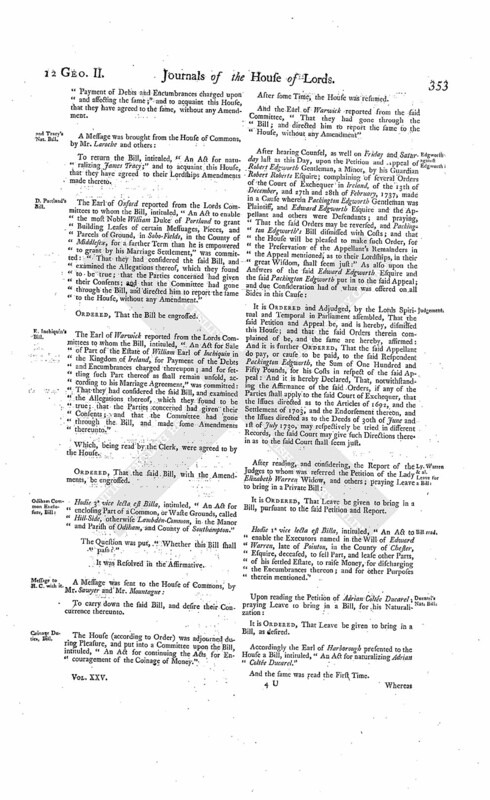 An Act for vesting a Messuage and Lands, in Twickenham, late the Estate of the Honourable William Townshend Esquire, deceased, in Trustees, in Trust, to sell the same, pursuant to an Article entered into by the said William Townshend in his Life-time; and for applying the Money arising by such Sale for the Benefit of Charles Townshend, his only Son and Heir, an Infant." "12. An Act for vesting in Archibald Hamilton Esquire, commonly called Lord Archibald Hamilton, and his Heirs, the Lands, Tenements, and Hereditaments, in the County of Berks, therein mentioned, in Trust, to convey the same to Sir William Irby Baronet, and his Heirs; and for laying out the Purchase-money in the Purchase of Lands, Tenements, and Hereditaments, to be settled to the Uses, and upon the Trusts, therein mentioned." "13. An Act for discharging the Estate of John Sherwin Esquire, in the County of Hertford, from the Uses, Trusts, and Covenants, in his Marriage Settlement; and for settling an Estate, in the County of Nottingham, and Town and County of the Town of Nottingham, of greater Value, in Lieu thereof, to the like Uses." "14. An Act to enable Sir James McKenzie, of Royston, to sell Lands and Hereditaments, in the Sheriffdom of Edinburgh, for Payment of Debts and Encumbrances charged upon and affecting the same." "15. An Act for vesting the settled Estate of Stamp Brooksbank Esquire, in the Counties of Suffolk and Cambridge, in him and his Heirs; and for settling the Manor of Helaugh, and divers Lands and Hereditaments in Helaugh, in the County of the City of York, of greater Value, in Lieu thereof." "16. An Act for selling and disposing of Part of the Estate of John Worth Esquire, a Lunatic, for discharging the Debts, Portions, and Encumbrances, charged upon and affecting the same." "17. An Act for confirming certain Articles of Agreement, between the Lord of the Manor of Hunmanby and the Vicar and Freeholders of Hunmanby, in the County of York, for enclosing Part of the Moor in Hunmanby aforesaid." "18. An Act to enable John Mould Esquire, and his Issue Male, to take and use the Surname and Arms of Moore, pursuant to the Will of John Moore Esquire, deceased." "19. An Act to enable John Crouch Esquire, Eldest Son of Pyke Crouch Esquire, deceased, and the Heirs Male of his Body, to take and use the Surname of Pyke, pursuant to the Will of John Pyke Esquire, deceased." "20. An Act to enable Charles Gregory Esquire, now called Charles Gregory Wade, and his Issue Male, to use the Surname of Wade." "21. An Act to enable Risley Brewer and his Heirs to take and use the Surname and Arms of Risley, pursuant to the Will of Paul Risley Esquire, deceased." "22. An Act for naturalizing James Tracy, Christian Burckhard, Reyhlen Zacharias Nieman, and Susanna Hubert." Hodie 2a vice lecta est Billa, intituled, "An Act for explaining and amending an Act passed in the Tenth Year of His present Majesty's Reign, intituled, "An Act for Relief of Insolvent Debtors;" and so much of an Act, passed in the last Session of Parliament, as extends the Benefit of the said Act for Relief of Insolvent Debtors to Creditors whose Debtors were committed to Prison since the First Day of January One Thousand Seven Hundred and Thirty-six, and had chose to continue there." Ordered, That the said Bill be committed to a Committee of the whole House, on the First Thursday after the approaching Recess. Keridge's Assignees Petition, to be heard, against Part of the Insolvent Debtors Bill; and Counsel allowed on both Sides. It is Ordered, That the said Petition be referred to the Committee of the whole House to whom the said Bill stands committed; and that the Petitioners may be heard, by their Counsel, before the said Committee; as may also Counsel be heard for the Bill, at the same Time. Address for Account of Sugars, Ram, &c. imported and exported. Ordered, That an humble Address be presented to His Majesty, "That He will be graciously pleased to order the proper Officer to lay before this House, an Account of the Quantity of Raw Sugars imported into England from the Sugar Islands, and also the Quantity of Raw Sugars re-exported to Foreign Countries, from Christmas 1708, to Christmas 1738; distinguishing each Year, the Quantity imported from each Island, and to what Places exported. "And also, an Account of the Quantity of Refined Sugar exported from England, from Christmas 1708, to Christmas 1738; distinguishing each Year, and to what Places exported. "And also, an Account of what Quantity of Rum or Spirits, Melasses, Syrups, Sugar, or Panoles, have been imported into any of His Majesty's Northern Colonies in America, from any of the British Sugar Islands, from Christmas 1727, to Christmas 1737; distinguishing each Year, and each Colony and Island. "And also, an Account of what Quantity of Rum has been imported from any of the British Sugar Islands into England, from Christmas 1727, to Christmas 1738; distinguishing each Island, and each Year." Upon reading the Petition of Sir John Dinely, of Charlton, in the County of Worcester, Baronet; praying Leave to bring in a Bill, for dissolving and making void the Marriage of the Petitioner with Mary Lawford, he being willing to allow her some reasonable Maintenance; and "that he may be discharged from all her Debts and Demands, on her Account, since her Elopement:"
It is Ordered, That Leave be given to bring in a Bill, for the Purposes therein mentioned. Then the Lord Bathurst accordingly presented to the House a Bill, intituled, "An Act to dissolve the Marriage of Sir John Dinely Baronet with Mary Lawford; and to enable him to marry again; and for other Purposes therein mentioned." And that she be at Liberty to be heard, by her Counsel, what she may have to offer against the same, at the said Second Reading. Dominus Cancellarius declaravit præsens Parliamentum continuandum esse usque ad & in diem Lunæ, tricesimum diem instantis Aprilis, hora undecima Auroræ, Dominis sic decernentibus. 1. Origin, attested Copy of the Copy of a Letter; vide antea 2o Fe. bruarii, 1738.